A colleague pointed out this website to me. Was SMB is now Windows Communication Foundation. Even though it might seem small compared to all the products/services portfolio Microsoft offers to their customers, don’t forget that SCA is a young product. So the thrust behind it is huge, thus making its potential enormous. Ever wanted to know how Microsoft constructs it datacenters? How services like Azure, System Center Advisor, BPOS, Office 365 and the lot are hosted? I mean, even for cloud based services, it has to land somewhere in one or more datacenters. Otherwise it would be nothing but vapor-ware :). Of course, much of it is kept secret. But Microsoft is also proud about their achievements which is totally understandable. So they have put together some videos and animations about their state of the art datacenters. This is one of those videos. It shows clearly the approach Microsoft has chosen for its datacenters. Very interesting it is. Since the video isn’t technical at all, it is targeted at a broad audience. Enjoy! This posting is all about EventID 26319 which is shown in the OpsMgr event log of the RMS. I’ve seen this error many times in the past with SCOM RTM/SP1 based environments in conjunction with Windows 2003 DCs and domains which were on Windows 2000 mixed functional level. In cases the issue was solved easily by following the procedure in KB331951. But this bug isn’t gone at all. In SCOM R2 environments, on the latest CU level and placed in Windows 2008 based domains/forests, this error message is still there. And the earlier mentioned KB331951 doesn’t help here. It happens for users who have been assigned the Read-Only Operators Role in SCOM. When users like these have the SCOM Console open and a new Alert is shown, the above mentioned EventID is shown in the OpsMgr event log. Some searching on the internet showed that other people were affected by the same bug as well and even a bug report had been filed about it. But that bug report isn’t to be found anymore. So I filed a new bug report, to be found here. When you’re affected by this bug, please vote so the more change it gets to be addressed. Brian Wren has published a document which introduces a completely fictional application and then presents a design for a service model and health model that can be used to create an actual management pack. The purpose of this sample is to illustrate a logical approach for analyzing an actual application and stepping through a process for defining its monitoring requirements. The structure of the document can be used as a template for designing a management pack for your own application. Many of us may have bumped into this issue already. And annoying it is. Even worse, since it may disrupt production. When CU#3 or CU#4 is installed on SCOM R2 Managed servers (servers running a SCOM R2 Agent), non-SCOM 2007 R2 related services may restart. That’s bad. Really bad. Not only the restarting, but also the word ‘may’. Sounds like Russian Roulette and thus influencing Change Management in a negative kind of way. Since a day or so, Microsoft has published a KB article (KB2526113) in which they acknowledge the issue, describe the causes and how to work around it. It is to be expected that will be solved in a future CU for SCOM R2. New KB Article: Event ID 26380 - "The System Center Operations Manager SDK Service failed due to an unhandled exception"
KB2526827 describes above mentioned issue, the cause and how to solve it. This is a known issue and will be fixed in a future edition of the MP. For now Microsoft has published a workaround, to be found here. I have blogged about it before, but as it turns out there are other possible reasons for it as well. This posting will highlight them. When the Kelverion tool is used and the Opalis Operator Console is configured as a service, it runs under local system. Many times that account doesn’t have access to SQL. So correct that by allowing that account in SQL or changing the account this service runs under to one which is allowed access to SQL. Installing the Opalis components isn’t a hard process at all. This becomes a total different story however when you want to install the Opalis Operator Console. This is a real drama. Why? When requiring to install the Opalis Operator Console as a service, even more magic is required. It is evident that the installation method for Opalis Operator Console comes from an age where installations like these were default and done by real specialists/geeks who had time for such tedious tasks. But hey, the dinosaurs died some time ago, so this installation has to go where it belongs: to the museum! So it is good to see that Kelverion has made a utility which automates the installation of the Opalis Operator Console. And I must say, it works like a charm! Hello 2011 and goodbye 1970’s! Why? No more need for other mumbo jumbo in order to get the Opalis Operator Console running as a service. Opalis Operator Console installation files (found in the downloads for Opalis). But when all is there it is simple point and click and Kelverion will take care of the rest! Nice and easy. So when you’re about to install Opalis WITH the Operator Console AND you want to save yourself a lot of time AND frustration? Download the tool and be happy! Anyone working in the ICT or having any related job for that matter, can’t deny it: things are changing. Much is to be found and told about the cloud and what it can do. The cloud comes in many shapes and formats, like IaaS, Paas & SaaS. Also the formats can be different, like public, private, hybrid and community based. Even though this blog isn’t about the cloud, there is no doubt that it will affect SCOM as well. The question isn’t when nor why but more like how? The first steps in moving SCOM into the cloud have been made. What started under codename ‘Atlanta’ has been rebranded into Microsoft System Center Advisor (SCA). Windows Server 2008 and future editions. How it works? I have borrowed this diagram from Stefan Strangers weblog. Thanks Stefan! Basically SCA works along the same lines as SCOM. MPs are required, Agents and Gateways. Since Kerberos can’t be used here, a certificate will be generated on the fly while the Agent is pushed out to the server being monitored by SCA. On premise the customer will install a Gateway Server which communicates with SCA in the cloud and the monitored servers on-premise. The MPs are already present in the cloud and need no further attention. For now SCA isn’t meant for real time monitoring like SCOM. Why? It is aimed at assessment of the configuration of the monitored servers. This assessment runs on periodic basis. SCA collects data on intervals of 4-8 hours. This data is analyzed once per day and uploaded to the cloud once a day. So no real time monitoring (for now that is). However, the assessments are based on best practices. So when you want to know whether your servers are up to specs, based on BPs, SCA can tell you that. When you want to test drive the Release Candidate of SCA, go here. All you need is a Windows Live ID. The installation is pretty straight forward. For now SCA supports a limited set of systems/services. But that will most certainly grow in the future as well as the functionality. So for me the question is not whether SCA will deliver SCOM functionality (real time monitoring) but when. I look upon myself as a consultant who is at the moment specialized in SC products and especially SCOM. But ICT is an ever changing landscape. So in order to stay in business, I have to change as well. Even better, to embrace it. And to be frankly, that’s why I like ICT. Never ever a dull moment. Because the cloud is becoming BIG and all major companies are aiming at it (Microsoft will target this year +90 % of it’s total R&D budget to the cloud…) I have to take a deeper dive in it as well. Got above mentioned error in a SCOM R2 environment. Many subscriptions were in place and functional. One subscription did not work however. Alerts were shown in the Console, but the Alert wasn’t send out. Time to investigate the Subscription which should do that. Opening the Subscription wasn’t a problem, but when the Criteria option was selected this error was thrown: Guid should contain 32 digits with 4 dashes (xxxxxxxx-xxxx-xxxx-xxxx-xxxxxxxxxxxx). It turned out that the Criteria was based on a Rule which was changed after the subscription had been made. Normally all is just fine, but the Rule was deleted and then rebuild. So the Subscription didn’t know anymore what Rule to target. The Channel used in the Subscription has been removed/changed significantly. All these reasons do have the same underlying cause: a new GUID will be generated for the items mentioned before (Rule/Monitor, Subscriber, Channel) which won’t match the one in the earlier made Subscription. Therefore the Subscription will be broken and malfunction. Of course, changing an existing Rule/Monitor, Subscriber, Channel won’t change the GUID. But recreating it will do so. Some years ago there was a TV commercial about Heinz ketchup. A man and a woman, eating French fries with Heinz Ketchup, were asked whether they ever tried ketchup from another producer. The man kept on eating and the woman asked: ‘What other ketchup?’ and continued her meal. Man and woman cracked a smile and said nothing more. The message was clear and simple: For them there was only one ketchup, the one from Heinz. Nothing else. Looking at SCOM in conjunction with monitoring VMware there is – if you ask me – the same situation going on. Yes, there are multiple vendors offering monitoring solutions for VMware and hooking it up to SCOM. But the Heinz experience for me personally is the one coming from Veeam. Why? As we all know a VMware based environment is far from simple. It consists out of one or more storage solutions, network layers, physical servers (working in concert) which are the hosts for all the VMs, the control layer (vCenter) and the lot. Covering all these aspects in SCOM isn’t easy. And VMware hosts are picky when it comes down to installing (additional) software. So you want to hook up SCOM to it, but in such a way that it doesn’t create any additional burden nor requires the installation of additional software on any host or guest. Also, you don’t want to introduce an additional framework which needs serious maintenance, planning and studying of your staff in order to understand and manage it. After all, you installed SCOM to reduce the workload and not to make it more heavier. On top of it all, the complexity of monitoring a VMware environment must kept away from you and your staff. You only want to put a thermometer into VMware and have SCOM report on it. Period. Whether it’s about the storage, the VMs or the hosts, the CPUs, physical or virtual, you want to KNOW what is happening. And again, all the complexity must be out of sight and yet you want to know it ALL of your virtualized environment. And it must be scalable. Whether you run two VMware Hosts or 250, it must be covered by the monitoring solution. The installation must be straight forward and well documented. So the complex stuff is kept away from you while SCOM will show an in-depth view of the status of your VMware environment. For me, and many of my key customers running VMware environments and SCOM, have found the solution with Veeam. It rocks! All above mentioned issues are addressed. So I am a believer when it comes down about how to monitor VMware with SCOM. No questions there. But how to convince the customers? Of course, I can be very enthusiastic about good products. Can tell them a lot about it. But seeing is believing. So I can show them a real life environment with VMware and SCOM. But that means traveling, planning and the lot. Wouldn’t it be nice to show Veeam and SCOM from my laptop? My laptop is Windows 2008 R2 SP1 based, so running a VM isn’t an issue at all. But running one or more VMware Hosts from it isn’t possible. So how to go about it? And those are not just wallpapers. These are fully clickable, like any other real item in SCOM. Nice! This is really great. Now I can demonstrate VMware monitoring from my laptop! And of course, a real life demo is still possible but the first impression is the most important one. No more additional travel and planning needed for that one. Nice! Notification partially working and nagging EventID 4503 in the OpsMgr Eventlog of the RMS? Wow! Got this situation at a customers site. Took me a long long time to crack it. But solved it none the less. Some people were receiving Notifications but others weren’t. Strangest thing was that there seemed to be no logic behind it at all. So some Alerts tied to Channel A didn’t get out, but other Alerts, using the same Channel, did get out. I tried many things, like opening all Subscriptions, cycling through all screens and save them one by one. Opened all Subscribers, looking for errors, found some, corrected them but again EventID 4503 kept on nagging me… Checked out all Channels but found nothing wrong there as well. I exported the MP containing the Notification Model (Channels, Subscribers and Subscriptions) which is the Notifications Internal Library MP. This MP is unsealed and every change in the Notification Model is put into this MP. The Subscriber was also just fine. Nothing fancy or any other magic happening there. What was left, was the CHANNEL! So somehow the Channel was causing all this mischief. But why? And most important: from WHERE? Channel was pretty straight forward as well. Using two Exchange servers. Talked to the Exchange guys/girls and they told me everything was just fine there. However, I have learned my lessons the hard way about presuming. So time to test it as well. I downloaded the Notifications Test Tool and used the configured SMTP Channel to send an Alert to my internal e-mail account. Which worked! Now one could say this is not good since the Notification Channel turned out just fine. But thing is, a Channel consists out of many components which might break or cause issues as well. So all this tool told me is that the BASIC functionality of the Channel was OK, like the configured Exchange servers. But how about the deeper configuration settings of this Channel? generated, so configurable Items 1 or 2 (or both) were the ones causing all this havoc. And… YES! A Notification was sent out and received by me! Time for some experiments. Quickly it turned out the configurable item E-mail Message wasn’t any problem. When I copied the formula from the ‘problematic’ SMTP Channel into the working one, it kept on working. However, when I copied the formula from the E-mail Subject from the ‘problematic’ SMTP Channel into the working one, EventID 4503 was back again! Finally! The item causing the grief was found. But WHY? When I compared the ‘problematic’ SMTP Channel with the working SMTP Channel there was only ONE difference: it contained the header $Data/Context/DataItem/AlertDescription$, which is actually the Description of the Alert as shown in the SCOM R2 Console. And… YES! A Notification was sent out and received by me!!! Great! I pinpointed not only the item where it went wrong (the SMTP Channel) but more important, the REAL cause, the header $Data/Context/DataItem/AlertDescription$. Nice! I imported the export file of the Notifications MP, containing ALL Channels, Subscribers and Subscriptions. Adjusted the Channels based on my findings (removing the header $Data/Context/DataItem/AlertDescription$ in configurable item E-mail subject) and all was well now. All Alerts meeting the Notification criteria were sent out. No more EventID 4503 in the OpsMgr Event log to be found again. Nice! So whenever you bump into this nagging Event and the earlier mentioned blog postings do not match your case, try this approach by removing the header $Data/Context/DataItem/AlertDescription$ in configurable item E-mail subject of the SMTP Channels and you should be fine again. And not just that, my customer wanted to document its Notification Model in more detail. Not needed any more since I already had done so while solving this issue! So this customer was happy twice: the Notification Model was fully operational AND thoroughly documented. Yesterday Microsoft published a new KB article describing above mentioned issue. KB2518786 describes it in detail and offers a workaround as well. SCOM PFE Tim McFadden, has made some good tools before like the Remote Maintenance Tool. This piece of software is really great since it offers functionality which isn’t present in SCOM by default. Yesterday he published a new one, the Subscription Copier. What it does? Taken directly from his posting: ‘Subscriptions copier is a simple tool for copying subscriptions and helping with alert escalation’. Tool to be found here, documentation included. 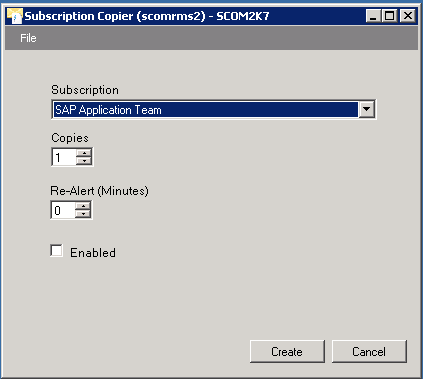 Thanks Tim for sharing another powerful tool for SCOM. Great job! My blog is not about virtualization but this one is really special. Already signed myself up for this one or better, three days. It will cost me three evenings (19:00 until 0:00) since I live in another time-zone (GMT+1) but there is much to be learned so it’s worth the investment. Just one week after Microsoft Management Summit 2011 (MMS), Microsoft Learning will be hosting an exclusive three-day Jump Start class specially tailored for VMware and Microsoft virtualization technology professionals. Registration for “Microsoft Virtualization for VMware Professionals” is open now and will be delivered as a FREE online class on March 29-31, 2010 from 10:00am-4:00pm PDT. We will even be highlighting SCVMM 2012 for an hour! Bumped into this issue in a SCOM R2 environment of a customer of mine. As a result the perfmon Reports missed out days of data. Have had a similar issue before and after having cracked it, the data came back. The data is moved to aggregated tables. Basically, when the Perfmon Reports are not showing all data, most of the time the data is present in the Data Warehouse, but is not processed completely. Somewhere it is stuck. By removing the cause of it, the Reports will functioning again. Of course, it takes some time for the data being processed (depending on the total amount of data in the DW), but finally, the Reports end up just fine again. Let’s get back to this posting now. Especially the last EventID contained good additional information: ‘Exception 'SqlException': A network-related or instance-specific error occurred while establishing a connection to SQL Server. The server was not found or was not accessible. Verify that the instance name is correct and that SQL Server is configured to allow remote connections’. After having talked with the engineers running these servers it turned out that the VMs weren’t configured correctly. The VM for the SQL server ran an iSCSI initiator. But this is not OK. So they changed it in VMware itself to a raw LUN-mapping and assigned it to the VM hosting the SQL Server instance. Danielle Grandini, a fellow MVP, already blogged about this issue, to be found here. However, I am not the type of person to modify SPs by hand. So I skipped this option and used another approach: I removed the culprit MP (the Exchange 2010 MP) and afterwards I deleted the whole Dataset (Microsoft.Exchange.2010.Reports.Dataset.Availability) from the Data Warehouse causing all these issues with a certain SP. Got this one from CSS a while back. I will NOT share it. Afterwards the event log of the RMS turned back to normal again. No more issues. No warnings, no errors. And believe or not, the Reports came back to live again! So all perf data was to be found again. How nice and neat!